Members will be aware of the significant Court of Appeal judgment in “The Renos” last year. The claim dealt with the question of whether SCOPIC costs could count towards a CTL calculation in a Hull and Machinery claim. Because of the way in which SCOPIC operates, it is more likely to apply in the salvage of smaller vessels, so the ruling was of particular interest to our type of membership. The case has now been listed for appeal at the Supreme Court, with a hearing date set for the next few months (10 April 2019). 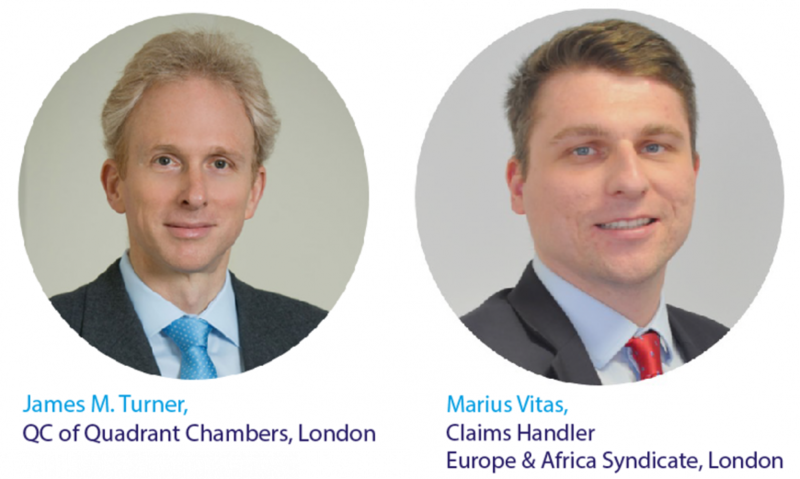 As we prepare to hear the arguments on both sides, we invited James M. Turner QC of Quadrant Chambers and Marius Vitas from our LCC team, to summarise the key subjects of SCOPIC claims, CTLs and suggest how they think the Court of Appeal judgment might affect the industry, if upheld. Traditionally, a salvor is only paid if the salvage is successful, and its remuneration cannot exceed (and will only in very rare cases even match) the salved value of the property at risk (typically ship, cargo and bunkers). As a result, salvors were rarely incentivised to intervene in the most difficult cases, as they would not be rewarded for doing so. The consequences in terms of potential environmental damage (and associated liability) are obvious. SCOPIC is a bolt-on clause to the Lloyd’s Open Form of Salvage Contract (LOF). If included in the LOF Contract and invoked by the salvor, it effectively guarantees the salvor a reasonable remuneration for the personnel and material deployed in attempting to salve the casualty. SCOPIC remuneration is only payable to the extent that it exceeds a conventional salvage award, so there is no question of the salvor recovering twice. Another difference between SCOPIC and salvage remuneration is the identity of the insurer who funds it: salvage is ultimately paid by the property insurer (hull and machinery in the case of the ship), but SCOPIC is a P&I matter. That is because the liabilities avoided by a successful salvage of a valueless ship (i.e., wreck removal and pollution) are P&I risks. “… liability to pay such SCOPIC remuneration shall be that of the Shipowner alone and no claim whether direct, indirect, by way of indemnity or recourse or otherwise relating to SCOPIC remuneration in excess of the Article 13 award shall be made in General Average or under the vessel’s Hull and Machinery Policy by the owners of the vessel” [emphasis supplied]. The principle of a CTL is straightforward: where the cost of recovery and repair of a damaged ship exceeds its insured value, its owner may abandon it to the hull underwriter and claim its insured value under the hull policy. In practice, hull underwriters seldom (if ever) accept abandonment, so that the assured is usually left with the damaged hull as well as the insurance proceeds. But what counts towards the cost of recovering and repairing the damaged ship? It has always been the case that salvage costs count, and it seems only fair that costs incurred in preventing further damage to or loss of the ship should be included in the overall calculation. But what about SCOPIC costs? Those costs are incurred (practically speaking) not so much to preserve economic value in the ship as to avoid liabilities to third parties (such as littoral states and their citizens who derive a living from the sea). This issue arose in the recent Court of Appeal decision in The Renos  EWCA Civ 230. The ship suffered an engine room fire and salvage services were rendered to it under an LOF (with SCOPIC included and invoked). The owner eventually gave notice of abandonment and one issue for the Court (among several others) was whether SCOPIC remuneration could be included in the CTL calculation. If it could, then the vessel was a CTL; if it could not, then it was a partial loss only. The Court’s decision is not beyond criticism (see, e.g., http://bit.ly/JTQC_RNS, for a detailed account of the origins of SCOPIC and commentary on the Court’s reasoning) and permission was granted to appeal to the Supreme Court. From the point of view of the insurance industry, the main implication of The Renos is that it allows the practical application of liability insurance (P&I) to influence the outcome of a claim on property insurance (H&M). That was never the intention of the market: see the York-Antwerp Rules, the ITC (Hulls) clauses and paragraph 15 of SCOPIC (all referred to above). It can also never have been the intention of the framers of the 1906 Act, as SCOPIC (and its progenitors) lay well over half a century in the future when it was passed. The H&M market may respond by amending the ITC (Hulls) clauses to exclude SCOPIC from CTL calculations, though such a change would surely meet with resistance from owners. The Court’s decision could also weaken market support for LOF (which is not universally popular with hull underwriters). That could have serious long-term implications, for the salvage industry, for the environment and – by extension – for P&I insurers. From the Association’s point of view the recent Court of Appeal decision in the “Renos” posed some interesting practical considerations as to its impact on the casualty management when different insurers are involved. A court decision in this area is welcome to say the least, as there have been relatively few legal precedents that deal with the issue of CTL assessments, and in particularly whether SCOPIC expenditure can be included in the calculation. It has been common ground that the costs of repair under section 60(2)(ii) of the Marine Insurance Act 1906 included costs of recovering the vessel so that she may be repaired, which is known as the cost of salvage. As James indicates however, the Act was never updated to expressly stipulate which salvage remuneration, i.e., Article 13 or Article 14 / SCOPIC payments should count towards the CTL assessment. As noted above, Article 13 and Article 14 / SCOPIC are paid by different insurers (hull and machinery and liability insurers respectively). However, the concepts are not completely distinct. The assessment of the salvage award paid by H&M underwriters under Article 13 is based on a set of ten criteria; the second of which is “the skill and efforts of the salvors in preventing or minimizing damage to the environment”. One factor which the court accepted was a traditional determination as to whether a vessel is a CTL is the “prudent uninsured shipowner” test. In other words, would a prudent uninsured shipowner, faced with a vessel in the state it was, and knowing of the expected costs of recovering and repairing her, proceed with its recovery? Or would they consider it not worth salvaging economically and leave it where it lay. If we extend this test to SCOPIC costs, it is fair to say that a prudent uninsured shipowner would have to include them in their considerations, if the vessel were to be salved under an LOF contract. In other words, the property could not be salved without the SCOPIC costs being paid, where they applied. Further, although some concerns have been raised in respect of the use of LOF following the “Renos” decision, little has been heard as to what benefits a clearer or earlier CTL assessment could bring. Delays in declaring or agreeing a CTL can cause significant problems in the management of a casualty situation. If the “Renos” can, even in some cases, expedite these decisions, it should allow liability insurers to intervene more promptly. This can only be a good thing in terms of mitigating unnecessary costs, protecting the environment and allowing for a safer and usually less complex wreck removal. James has already indicated that if the Court of Appeal judgment is upheld by the Supreme Court later this year, one result might be that hull insurers will amend their standard policy terms. As he notes, this would be unpopular in the market, and amending such longstanding conditions is also no mean feat, even where the changes might be considered uncontroversial. Another wholesale approach hull insurers may take is to try to increase rates to account for what they see as a new, heightened exposure. However, perhaps the most natural response would be for them to merely exercise their right of election to take over the owners’ interest in any such wrecks; i.e. those where they feel the repair cost has been artificially inflated to the level of a CTL because of costs which will in fact be dealt with by a P&I Club.